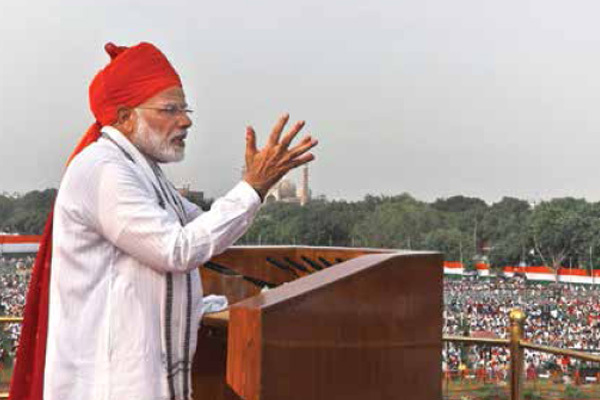 NARENDRA Modi is a leader of the grandiloquent gesture. Prime Ministers of the past, when they won unprecedented victories in parliamentary polls, did not make a big song and dance about it. They went in meekly and when their turn to speak came they made an acceptance speech without displaying their histrionic abilities to leave an indelible mark on the pages of history. Be it Indira Gandhi in 1971 or Rajiv Gandhi in 1984. Not so Narender bhai. His first historic moment came in 2014, when he led the BJP to a massive mandate in the Lok sabha. Now the thespian in him decided to make his entry into Parliament house a magical moment that would be remembered for a long time. It was as if he were a latter day Moses entering the Dead Sea with his cohorts thus displaying his great powers as the Prophet of Judaism. When he arrived at Parliament House, he stopped at the main entry, a lonely figure chiefly responsible for the victory. All his followers also stopped but-several steps behind him, thus underlining the undeniable fact of his leadership. He bowed down and touched the entry point with his forehead as if he was a devotee seeking the permission of the presiding deity to enter his divine domain. Close observers would have, if they looked sharply enough, seen his lips mumble a mantra to invoke the divine grace on the purely mundane act of entering a place for transacting political business. The same gestures of grandiloquence invested two mundane handkerchiefs with magical bursts of divine energy. 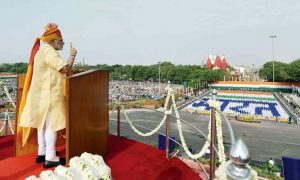 The first occasion was the 15th of August and Modi was speaking from the ramparts of the Red Fort in his highly clipped language of RSS worship and playing the tricky games of Hindutva, while pretending to extend all the human rights to the non-Hindus. For the first time, the huge audience, impressed with the bandgala jacket over a 56-inch chest and an oversized Maratha turban reminiscent of Chhatrapati Shivaji, were suddenly overshadowed by a large white handkerchief. This new addition to the Prime Minister’s sartorial attire was meant to dry the huge beads of perspiration that were constantly forming on the great man’s forehead. This large white handkerchief emerged again and again in Modi’s protective hands, thus becoming a visible symbol of the State’s imperial might and supreme power. Hardly had the millions recovered from this open display of the supreme exhibition of the Centre’s authority than the 16th August supervened and Modi was again in his ‘Divine Form’, walking beside the gun carriage of Atal Bihari Vajpyee. 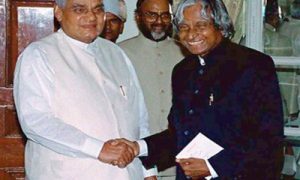 Again the handkerchief was merely a reminder of his viratswarupa that compelled the incumbent Prime Minister to walk several kilometres in hot and humid weather, singing the hymn of people’s Government. 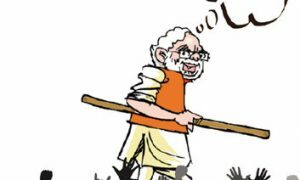 Thus we have now New Delhi, the city of two large white handkerchiefs, ineffectually trying to conceal the basically aggressive agenda of Modi’s brand of politics.